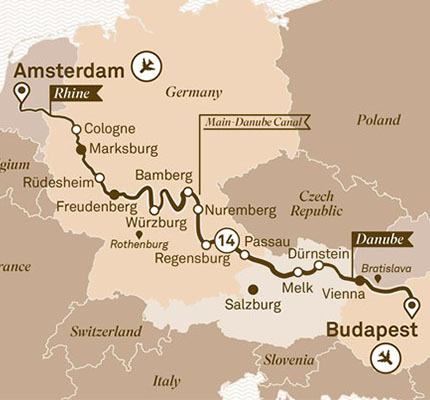 You’ll be enchanted by the grand palaces and fairytale castles of Europe on this 15 day cruise from Amsterdam to Budapest along the Rhine and Danube. Travel through a region steeped in the history of ancient trade routes, forested hillsides, idyllic vineyards and romantic towns. Restored castles still stand watch from their position atop dramatic hilltops. This is a journey that will take you through the Europe of your imagination, full of wonder on a life-changing luxury European River Cruise. 14 nights on board an all-inclusive Scenic Space-Ship. Cruise the iconic canals of Amsterdam. Private ‘The Best of The Sound of Music and Salzburg Show’ in Salzburg. Medieval feast at Marksburg Castle. Guided city tour of Budapest. Cable car to Niederwald Monument. Sundowners event in the Wachau Valley, Dürnstein. Guided tour of Schönbrunn Palace. 41 meals – 14 breakfasts, 13 lunches and 14 dinners. Complimentary beverages including in suite mini-bar refilled daily. Professional English speaking Tour Director, airport transfers, all tipping and gratuities, and more. ^Pricing is based on 6 November 2019 departure, other dates may have a different pricing. *Tour operates in Reverse Order. Please check with your consultant for itinerary details. #General Information & Conditions These terms and conditions are additional to the full terms and conditions contained in Scenic Europe River Cruise 2019 brochure and on www.scenic.com.au/terms. All bookings are subject to Scenic’s full terms and conditions. This flyer is supplementary to the full brochure, please refer to full brochure for relevant cruise and/or tour departure dates, itinerary and fares. Prices are in Australian Dollars. For Earlybird offers on land tours and cruises of less than 10 nights please contact Scenic for further details. Flight Offers Free flights are based on wholesale airfares in Economy Class with an airline of Scenic’s choosing and are available on all departures featuring cruises of 11 days or longer and are subject to availability. Fly Business class from $3,995 is based on wholesale airfares with an airline of Scenic’s choosing. All flights offers are subject to availability of appropriate airline class and once sold out surcharges will apply. Flights must be booked by Scenic. A non-refundable deposit of $1,000 per person is due within 7 days of booking. A second non-refundable deposit of $2,000 per person is due by 31 October 2018 or 11 months prior to travel, whichever comes first. Flights and Ticketing Dependant on departure date and time of booking the required booking class for airfare offer may be too far in advance to book with the appropriate airline. If the required booking class is unavailable at time of booking, air surcharges will apply. The flight quote including air taxes and surcharges will be advised once all air sectors are confirmed. Total cost is final only at time of ticketing, should taxes increase from time of reservation a surcharge will apply. All Earlybird airfare deals are subject to availability and scheduled for travel to meet the brochure tour departure dates and ports. Any requests outside of the tour dates may incur seasonal surcharges as enforced by the airline. Once issued, air tickets are subject to amendment and cancellation fees as established by Scenic including any applicable airline fees. For full conditions of offers contact Holidays of Australia & the World.